The launch Jaguar F-TYPE Coupé at Grange Swindon Jaguar on the 24th April gave staff and guests the opportunity to say farewell to a much loved member of the Grange Swindon team, Bernard Harris. 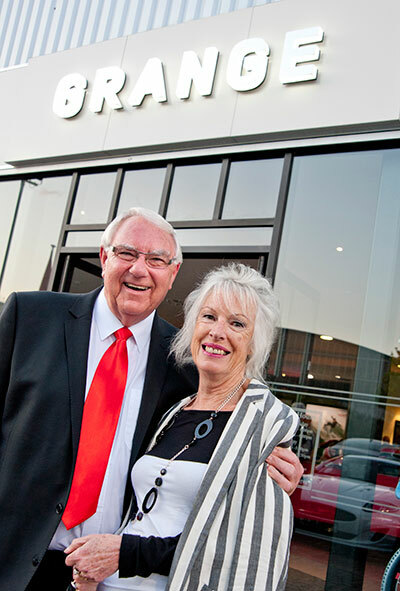 After 25 years with the dealership, Bernard has decided to retire and left at the end of April. The evening was a fitting end to such a loyal and committed member of the team. As for the event itself, we invited guests to join us at the Grange Swindon dealership, for the launch of the Jaguar F-TYPE Coupé. 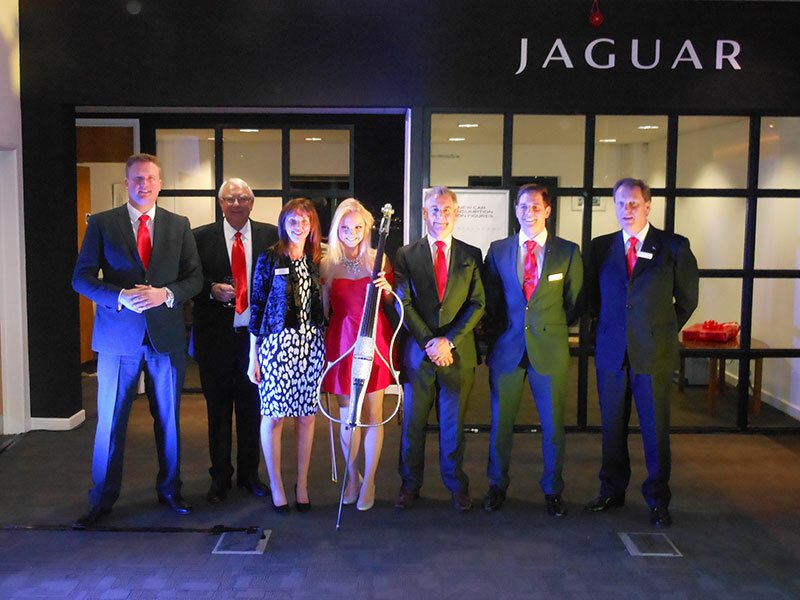 The invited guests had the opportunity during the evening to experience the latest addition to the Jaguar range, and learn more about the distinguished and stylish brand. During the evening, there was live music from Lizzy May and food and drink for the guests to enjoy. For more information about the F-TYPE Coupé, please contact any of our Grange Jaguar dealerships today. This entry was posted in Uncategorized on May 2, 2014 by motorparks. 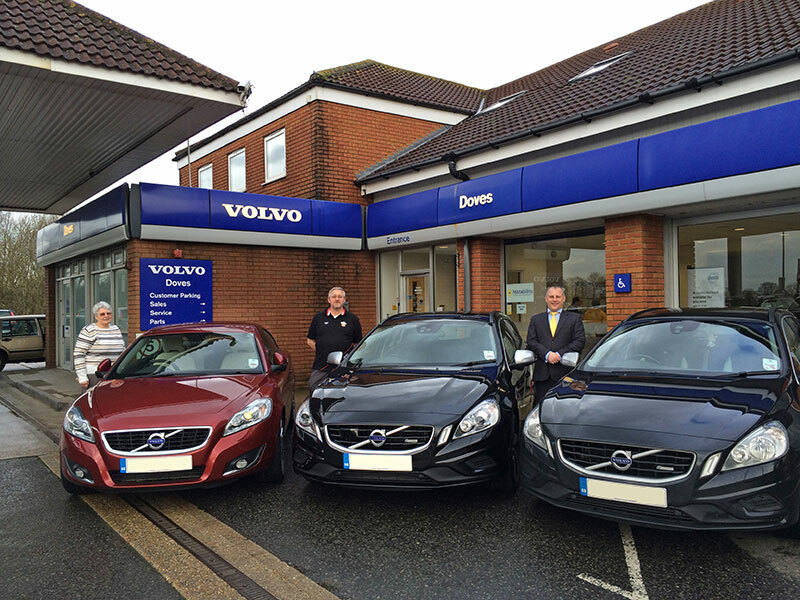 Averil Clingo and Steve Willie have bought enough cars from Doves Volvo Gatwick in the last four years to be considered part of the family. The couple began their relationship with Doves Gatwick in 2010 when Averil purchased her first C70 SE Lux 2.0ltr diesel, a black sapphire ex-demonstrator. She then changed that car in the summer of 2013 for another C70 special edition Solstice in Flamenco Red (pictured) after seeing it and deciding she must have it. This was Steve’s day though. He is pictured here on handover with Averil and Stuart Neve changing his V60 D3 R-Design Black Sapphire for the V60 D5 All Wheel Drive R-Design, finished in black sapphire that he has had his eye on for a while. Averil, who works for the Caravan Club, commented on how happy she was with both of their new cars and how they enjoy buying their cars at Doves Gatwick. Steve, a production manager at a local brickworks, did comment positively on his purchase experience but owing to his unique sense of humour, his comments are unprintable! The whole team at Doves Gatwick wish Averil and Steve the very best with their new cars and look forward to seeing them again soon. 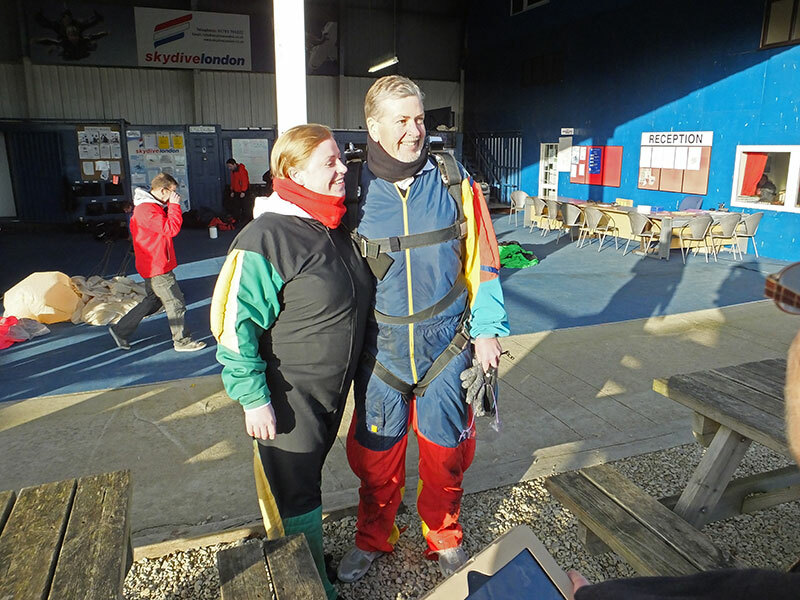 Chris Everett, aged 55, a collection and delivery driver at Swindon Motorpark, along with Hayley Smith, aged 33, a service advisor, carried out a 10,000 ft skydive for children with cancer charity C.L.I.C. raising over £1100 for the charity. What makes this more amazing is Chris weighed 25st 12lb 14 months ago and he decided a dramatic lifestyle change was in order. Chris says openly that he ate all the wrong things, always snacking on pies and fatty foods and eventually the weight just kept piling on. Chris suffered an infected gallbladder which needed to be removed but before the operation he had to lose at least 3 stonesoChristotallychangedhiswayofeating. This time fresh fruit and vegetables and fish were the main source of his diet only consuming 1500 calories a day which he planned. After 3 months Chris had shed 3 stone and he was able to have the gallbladder removal . On recovering from this operation, Chris decided he liked what he was eating and decided to stay with it, and month after month with encouragement from his family and work colleagues at Swindon Motorpark he finally lost a massive 11 stone. He now weighs a healthy 14 stone 7lb and when the chance came for Chris to do something he really wanted to do, he couldn’t wait, so Chris and Hayley carried out the skydive. Chris says that it was the best experience of their lives and losing all this weight has brought a new lease of life for Chris. He says maybe running with the bulls in Pamplona could be on the cards for next year. He is an inspiration to his friends and family. Blackburn Motorpark Sales Associate, James Davies, recently became a TV celebrity taking part in “Cupid’s Hub” on ITVs This Morning. He found himself live on the programme in February as part of the Valentine’s Week entertainment. James applied to be on Cupid’s Hub along with the 3 women, of which one was chosen to go on a date with James after the show! allofitwasfilmed,wentwellandtheyevenshared a kiss! During his time in London, James spent time with This Morning presenters, Holly Willoughby and Philip Schofield, and also met other TV personalities. Videos of James’ experience are available to watch on the Hub section of This Morning’s website. 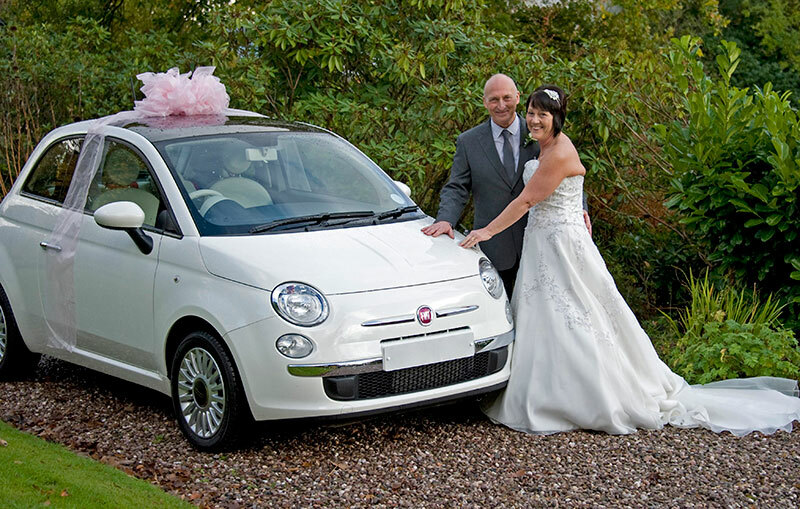 Bridegroom Paul Bottomley presented a surprise wedding gift to his newlywed wife on their wedding day with the help of Bolton Motorpark – a new white Fiat 500. Mr Bottomley made the purchase at Motorparks Fiat & Mazda in Bolton. Sales associate, John , helped organise the lovely surprise of the Fiat 500 1.2 Lounge in Bossanova White with pop cloth in red with ivory. The purchase was made in secret and with the help of the Sales Associate at Bolton, who then delivered the 500 to the wedding venue, Higher Trapp Hotel, Burnley, Lancashire, where the vehicle was presented to Suzanne Bottomley complete with a huge pink ribbon, immediately after taking their wedding vows. Mrs Bottomley was over the moon with her wedding gift – it came as a complete shock to her. A Thank You card arrived at Bolton Motorpark together with a wedding photo of the happy newlyweds saying “Thank you for making our day so special, it went down a treat, from Paul and Suzanne”. Another satisfied customer at Bolton Motorpark – ‘we are happy we could be part of their special day’. This entry was posted in News and Events on April 29, 2014 by motorparks. Our three Grange Aston Martin businesses within Cambria have been fortunate enough to be able to demonstrate the latest and most extreme car in the Vantage range – the V12 ‘S’. A car that is an unprecedented engineering achievement, combining a V12 engine with their lightest sports car, has resulted in a package of pure aggression; 15kg lighter than the V12 Vantage with 573PS of power pushing the car to a top speed of 205 mph making it the fastest production model Aston Martin have ever produced. Further enhancing the desirability of the car is the new seven-speed AMT transaxle gearbox specifically designed to tap the potency of the V12 Vantage ‘S’. With advanced light-touch paddleshifts, the gearbox provides motorsport engineering and race car capability giving maximum driver control to the road user. You would be disappointed if the new car, with this amount of power, did not have increased agility and ‘stopability’. This is achieved through a three-stage adaptive damping system, all new carbon ceramic brakes and a unique track- mode with delayed ABS. Extreme performance matched with extreme styling, bold new carbon fibre roof, grille and graphic packs, lightweight forged alloys, all new interior finishes and controls – never opulent but always dramatic, the V12 ‘S’ is without doubt the most ferocious Aston Martin ever produced. As if the Vantage V12 ‘S’ wasn’t enough, Aston Martin have also launched the ultimate convertible, their best Volante ever – the Aston Martin Vanquish Volante. Proportion, presence, purity, every guest who has seen the latest car agrees that Vanquish Volante delivers the most beautiful body shape in its class, with all new aerodynamically tuned decklid and tonneau, new full height windscreen where the glass directly meets the roof. 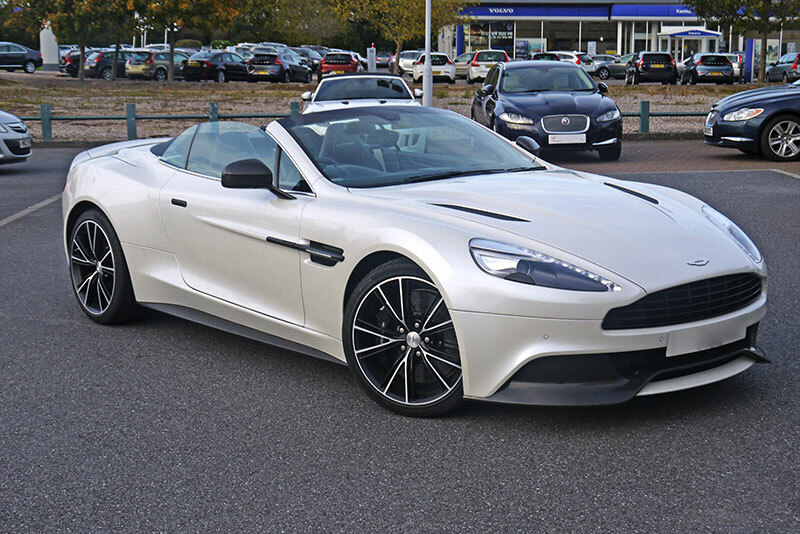 Powered by the AM11 V12 engine, producing 573PS and acceleration of 4.1secs, this is the quickest accelerating Volante Aston Martin have produced, it’s also the stiffest with a body that maintains all the dynamic agility of the Coupe. It doesn’t stop there; Vanquish Volante is the most technologically innovative convertible. The three layer lightweight fabric roof takes just 14 secs to fold, operating at up to 30 mph. The 1000W Bang & Olufsen BeoSound system monitors and adapts to the roof being open or closed, added to which the boot loading has more than 50% higher capacity that the DBS Volante. Combining 100 years of Power, Beauty & Soul, as beautiful inside as it is out, the Vanquish Volante sets a new standard in craftsmanship for its class, Aston Martin’s ultimate convertible is your design statement. Having recently connected with the Career Transition Partnership (CTP), who is the official provider of resettlement services for those leaving the UK Armed Forces, the Cambria HR department exhibited at our first recruitment fair. The fair was held at the Madejski stadium in Reading and attracted some 500 military personnel. They certainly kept the team busy, with many interested in the Automotive industry, keen to gather more information on the Company and details on the roles we employ. With larger Company’s such as Amazon, Coca Cola and ASDA also exhibiting we had a lot to live up to! But with our brands and our Four Pillars on display we attracted a lot of potential applicants. We think the photographs of the Aston Martins also helped!! 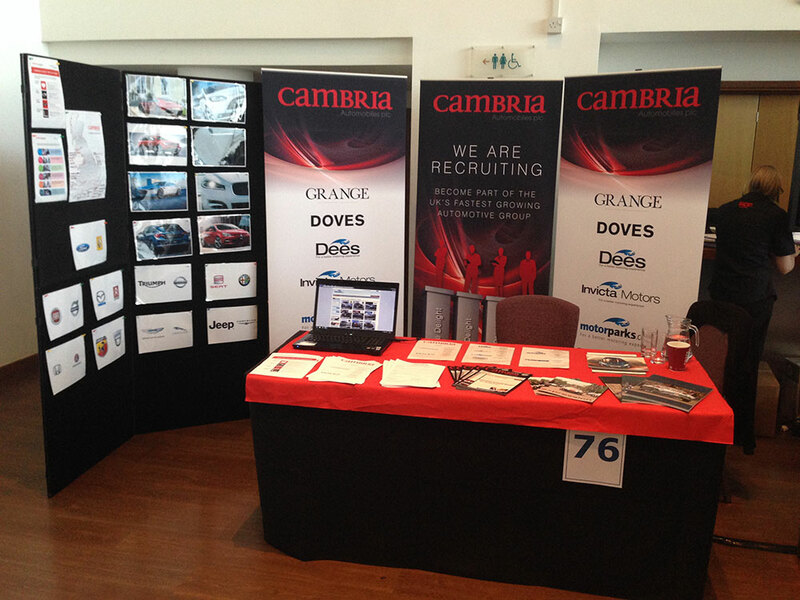 We will be continuing to attend and support the CTP events at future recruitment fairs. This entry was posted in Uncategorized on April 25, 2014 by motorparks.